Disclosure: I was provided the products mentioned below from Influenster. All personal opinions mentioned in this post are 100% my own and are not a result of any outside influence. From time to time I get fun little surprise boxes from Influenster full of products to review that I get to share with you here on the blog. This time it was the Uni Vox Box, a Vox Box full of products picked for us women who are also busy students on the go! First I would like to mention that joining Influenster is free and it is an amazing site full of great reviews from fellow members with wonderful perks such as being selected to review Vox Boxes such as this one, so if you are interested in joining you can head over to their site to become a member here! As someone who doesn't usually get her nails done or wear press on manicures I was a little hesitant to try these imPRESS nails but I really liked the pattern I received, and I liked the idea that they only last up to a week, so it's not a major commitment like with glued or acrylic nails. The instructions indicated that application takes only minutes and it really was that easy to apply a full set! While these lasted only about five days I did enjoy them while I had them on and may choose to buy them again in the future. While browsing their website they actually have some really great designs to choose from! When I first grabbed this out of my Uni Vox Box I thought it was such a great pop of color for Spring! I have actually been enjoying wearing this color with a variety of different outfits lately and having fun experimenting with different makeup looks to go along with this particular lip color. The price itself is worth giving it a try! 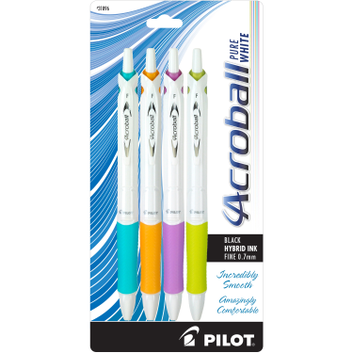 I received one of these Pilot Acroball Pens in my Uni Vox Box and one thing I can never have enough of being a student is pens! Also, with four kids running around my house they always seem to disappear somehow. This is one pen though that I will be hiding from them because I love it! The Pilot Acroball has a comfortable cushy color block grip that makes long note taking easier on the hands, which gives it an A+ in my book! Being an already loyal fan of Rimmel foundation, I currently use their Match Perfection liquid foundation, I thought it would be interesting to review their Stay Matte liquid foundation to see if I would maybe like it better than my current Rimmel liquid. I had previously selected to review the Ivory which is what I received. It appears I should have went with the Light Procelain as the Ivory was a little too dark for me, even though I have an olive undertone to my skin. The good thing is I tan very easily in the summer and I can save this to revisit and review in just a few short months which I plan to do as I have seen some great reviews come through already on this product on the Influenster website! For now I will stick to my Rimmel Match Perfection liquid which I am very happy with at the moment. Included in my Uni Vox Box were Playtex Sport Fresh Balance tampons. While I do not participate in any sports I am a busy mom on the go with four kids, so as many moms out there can relate that can be a sport in itself at times! 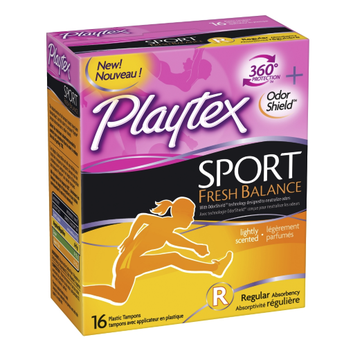 The Playtex Sport Fresh Balance comes with odor shield technology and a 360 design for sport level protection. I have always thought of Playtex as a go-to trusted brand in this area and I would recommend this product to anyone leading an active busy lifestyle! When I came across this little bottle of Red Rose REAL TEA water enhancer in my Uni Vox Box I was excited because I drink quite a bit of tea, especially on nice warm days! After reading that Red Rose REAL TEA was different in that it was a water enhancer with no dyes or coloring and that it was made from real tea I was ready to dive in and try it. You just add one squeeze per 8 ounces of liquid. Even better is that it can be added to hot or cold water to enjoy - and it tastes amazing! As you can see above it comes in a trio of different flavors. I received the Black Tea and I enjoyed it both hot and cold to test it out. This is one product I will definitely be buying again!